"Puce Women was my love affair with mythological Hollywood...with all the great goddesses of the silent screen. They were to be filmed in their homes; I was, in effect, filming ghosts." 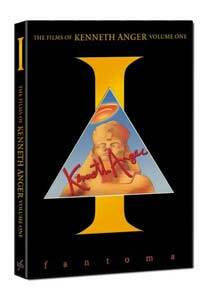 My first exposure to the work of Kenneth Anger was a few decades ago, while in college reading an article about Lucifer Rising, his 1972 short film that featured an original score by Manson family member Bobby Beausoleil, composed while in prison. That kind of piqued my natural curiosity a bit. And then there was talk of Anger's epic-but-never-completed film version of Hollywood Babylon, his Aleister Crowley influences, and a general air of unmitigated avant-garde weirdness. And then there's his name�Anger. When the title credits roll with "A Film By Anger" it seems to be an artistic statement more than anything else. There's no Lucifer Rising in this collection (I trust that's coming in a future volume), but what Fantoma has done here is go back to five of Anger's early works�spanning the years 1947 to 1954�and oversee a heavy-duty restoration process on each, as well as have the director provide commentary. The short films for Volume One are Fireworks (15m:04s), Puce Moment (06m:14s), Rabbit's Moon (17m:18s), Eaux d'artifice (12m:57s), and Inauguration of the Pleasure Dome (38m:20s), nearly all of which feature brief text explanations at the outset of the origins, the restoration and any other unique elements that viewers should be aware of. The narrative range for Volume One seems to find Anger pushing the world of dreams to varying degrees�from the rough homosexual undertones of Fireworks to the fantasy mime/dance of Rabbit's Moon�all filtered with the director's reliance on unusual or striking visuals. The dream vibe carries on in the bold colors and use of music in Puce Moment�all the more dramatic given that it was shot in 1949�in which the act of selecting a dress has an editing style that seems to pre-date music videos by a good 30 years, to the blue tint imagery of the Water Witch in Eaux d'artifice that acts as a tease to where this set is really going. All of that culminates in the disc's opus Inauguration of the Pleasure Dome, where Anger goes full bore into a surreal Pan-induced dream state, offering a self-described journey of "art nouveau decadence." These aren't short films that easily fall into a high concept description, instead they all kind of unfurl with daring, imaginative bursts�like a dream�and I have to think that a hipster visionary like David Lynch must have fell in with the pace of Rabbit's Moon at some point early in his career. In this one, Anger constructs mime-driven imagery, marrying a mix of Japanese myth and commedia dell'arte with 1950s doo-wop music. It's a lot to blend together, yet Anger makes it look all oddly natural. I'd call it a David Lynch moment, if it weren't for the fact it is from 1950. The trail of Anger's work is one of those long, strange trips, and the impressive restoration work done for this collection makes that an easier, more accessible adventure. If you're willing, that is. Image Transfer Review: All five films�shown in their original 1.33:1 aspect ratio�have undergone extensive restoration, and the results are really something to take in, especially with the shorts done in color. These new transfers�culled from a variety of sources, all of which are meticulously detailed in the liner notes�are remarkably clean. The included Restoration Demonstration shorts do more to show the work that's been done, cleaning up everything from nicks, scratches, and burns to enhancing the color tints. Audio Transfer Review: The Dolby Digital 2.0 mono audio presentation is 99.9% music, and the sound quality is a bit on the thin side, but devoid of any hiss or crackle. Anger's reliance on music�as opposed to dialogue�makes me wonder how this could have sounded with a grand 5.1 remix, but I'm not going to complain too loudly. Extras Review: Inside the thin slipcover is a 48-page book, complete with an introduction by Martin Scorsese praising the work of Anger. The rest of the book features stills, cast list, storyboards, quotes, and information on the restoration process for each film. And then there are the Anger commentaries�one per title�in which the director tells much about the production background and cast, but wisely sidesteps explaining their meanings. The tracks are intelligent and lucid without being rambling, and his recollections on location particulars and assorted production facts make it sound as if the films were shot yesterday. There are also four restoration demonstration shorts that compare and contrast the work done, and the results are deserving to be singled out just to show how poor the source material was. The segments are for Fireworks (01m:42s), Puce Moment (01m:11s), Eaux d'artifice (01m:24s), and Inauguration of the Pleasure Dome (01m:33s). The only film that doesn't get a restoration demo is Rabbit's Moon, which does have a brief set of non-tinted outtakes (02m:57s). Each film can be viewed separately from the main menu, or in one fell swoop via the Play All option (with or without the Anger commentaries). The back cover refers to Kenneth Anger as a "cinematic magician" and a "legendary provocateur." Right on. It's tough to call someone like Anger merely a filmmaker, because he's really more like an interpreter of dreams�good, bad, or otherwise. This collection of five of his early experimental works has been exceptionally restored by Fantoma, and each film includes an informative yet properly vague Anger commentary. I may not know art, but I know what I like. Highly recommended.